JIMS in association with Bawana Chamber of Industries organized a MDP on “Environmental Aspects of Sustainability and Fire Safety for MSME”. Challenges relating to resource depletion, production of greenhouse gases and environmental sustainability are attracting increased attention among the businesses. While constituting a majority of businesses, MSME enterprises lack, to a large extent, awareness of their business environmental impacts as well as the understanding that higher environmental performance can lead to competitive advantage for them in the future. Many of these enterprises have difficulty in recognizing environmental hazards and risks present in their business and have limited knowledge about relevant policy initiative in this respect. 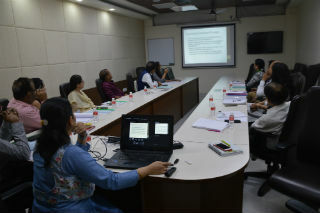 So a half day MDP was conducted for owners of MSMEs located at Bawana Industrial Estate in JIMS, Rohini, campus. Resource persons for the session were Mr Sarabjeet Singh, Station House Officer, Fire Department, Rohini who spoke on “Awareness on Fire safety issues for MSMEs” and Dr. B.C. Sabata, Senior Scientific Officer, Ministry of Environment, whose topic of discussion was “Challenges of managing environmental practices at workplace” & “Government initiatives related to environmental Practices”. 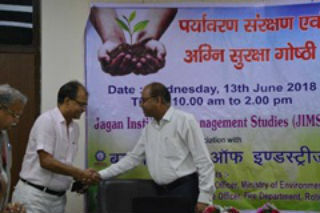 Dr.Pawan Gupta (Director, JIMS) and Mr. P.C. Jain, Chairman, Bawana Chamber of Industries also delivered their address.